My mom learned to make roasted eggplant dip from a Romanian friend. This friend used to roast her eggplants on the open flame, as that is the traditional way of doing it in Romania. My mom decided to do it her way and roast the aubergines in the oven instead. By doing so you lose the smoky flavour, but the outcome will have the same texture and will yield an equally great ingredient to make a delicious eggplant dip. 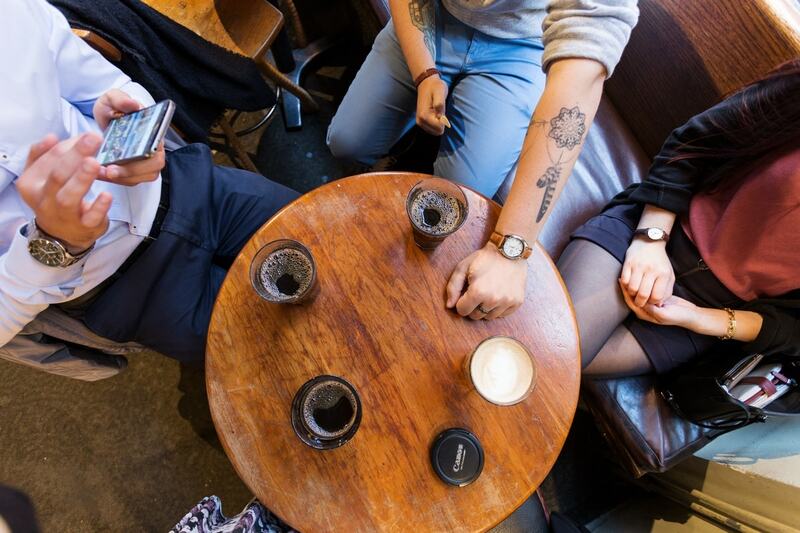 It was only years later, when I moved to Sweden and became familiar with canned Lebanese eggplant dip, that I discovered baba ganoush, or baba ghanoush. 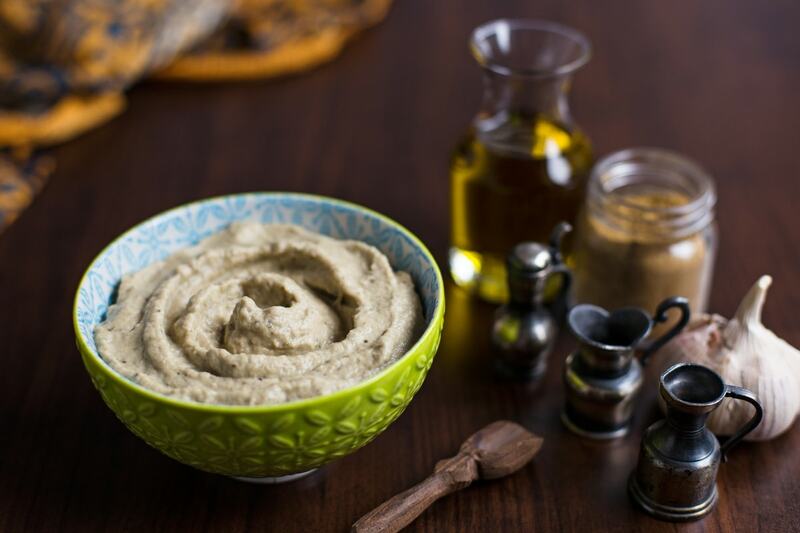 A Middle Eastern recipe very similar to the Romanian roasted eggplant dip my mom had learned to make years before, only with the addition of tahini. I believe that the Romanian way of preparing eggplant dip has its roots in the Middle East, and a variation of baba ganoush at some point in history must have made its way all the way up to Romania. So when my mom visited me back in the summer, she proposed making roasted eggplants. 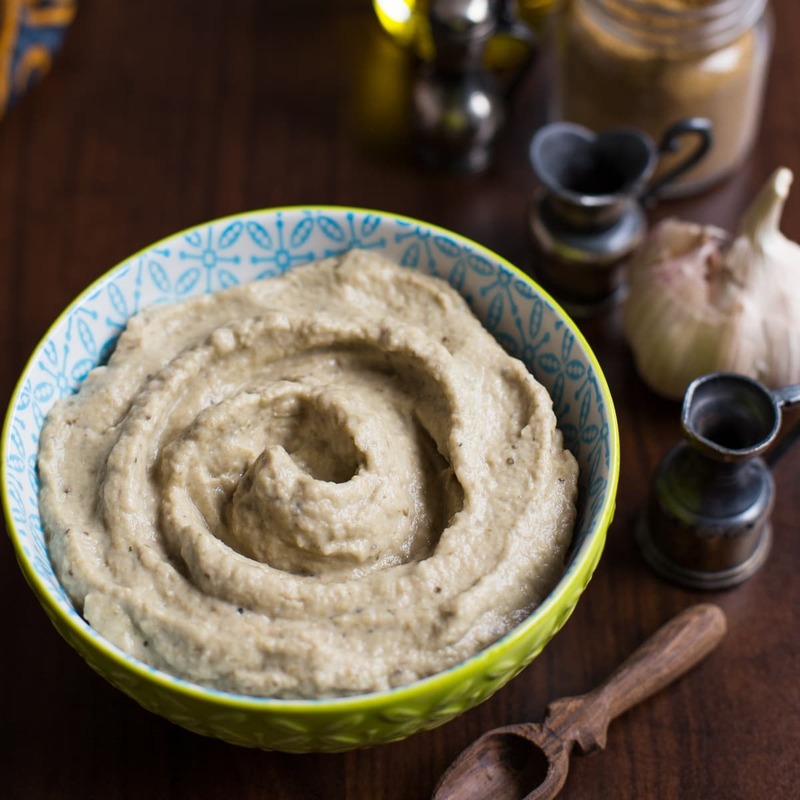 I happened to have tahini at home, so I suggested turning that into baba ganoush. Preheat the oven to 200°C. Wash the eggplants and slice them in half, lengthways. Place the eggplants on a baking tray lined with parchment paper with the cut facing down. Prick the skin of the eggplants with the tip of a knife a few times and when the oven has reached the right temperature place the baking pan in. Bake the eggplants for 30 minutes. Before proceeding with the recipe, the baked eggplants need to cool down to room temperature. 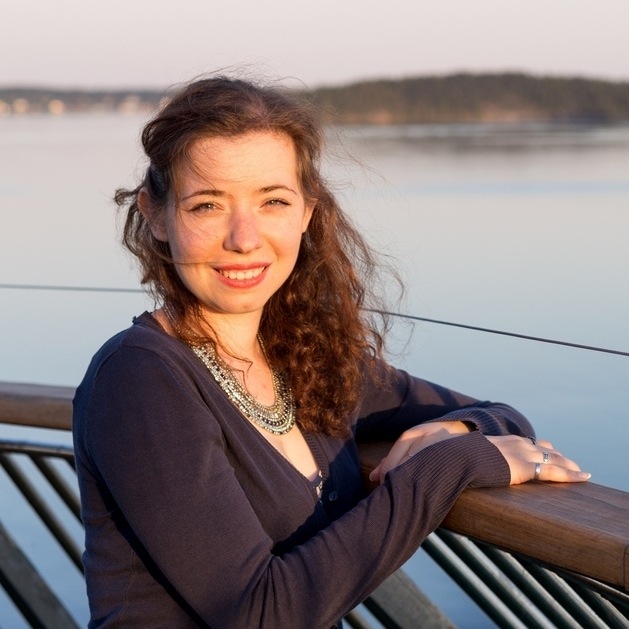 Once cold, flip them over and carefully scoop the flesh out, separating it from the skin. Discard the skin. Now either leave the peeled roasted eggpants on a strainer overnight, or squeeze the excess liquid if proceeding immediately. Too much liquid may result in a runny dip, when the desired texture is thicker. Once drained, set the roasted eggplants in a bowl, squeeze the garlic and add the salt, pepper, oregano and cumin. Add the tahini, olive oil and lemon juice, then blend until smooth. Serve as it is, or with some extra olive oil on the top. 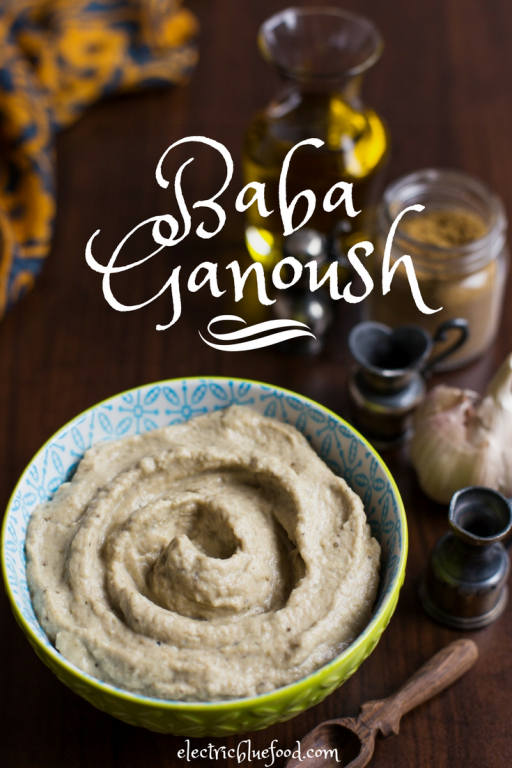 Baba ganoush is commonly served as an appetizer with other meze like hummus. The most common way to eat it is as dip with pita bread. Recipes I found online called for minced parsley to add for flavour. My mom, taking inspiration from the Romanian recipe she learned, prefers to use oregano. Oregano is one herb that wonderfully pairs with eggplant. 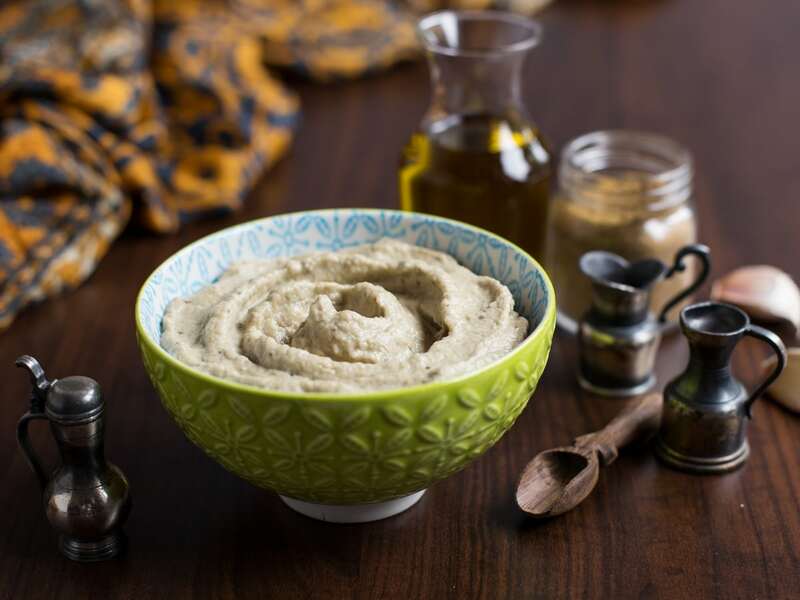 In this case, along with the garlic and olive oil, oregano really gives this version of baba ganoush a more Mediterranean twist. In order to keep true to this Mediterranean twist, we ate our baba ganoush eggplant dip with toasted ciabatta bread. Fusion cuisine can be that simple. If you have tahiniat hand try adding some next time. Actually, even just mashed baked eggplant with olive oil and salt sounds like a great option to me. I love everything about eggplants!